How much to give grandchildren during the holidays? 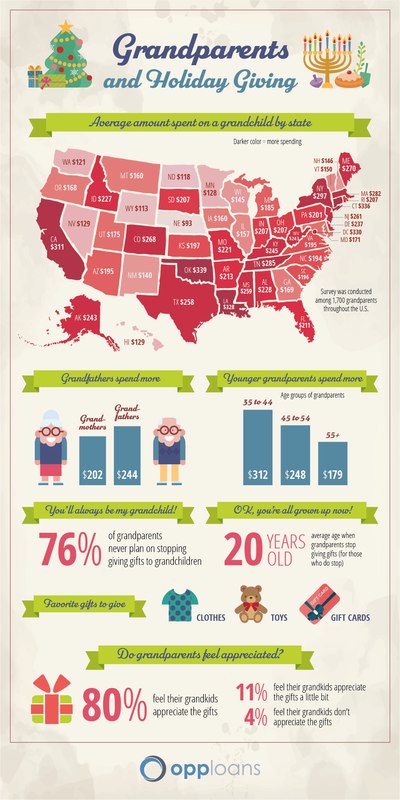 OppLoans recently conducted a survey on how much the average grandparent spends on a grandchild during the holidays. The survey, 1700 respondents, averaged out $218 per grandchild. Younger grandparents spent more, $312, than older grandparent, $179. See the infographic below for details. Those numbers seem reasonable, but let's fact-check. A question you should always ask when presented with a survey is who is responding to the survey? OppLoans surveyed their clients who are seeking payday loans. On the other hand, GoBankingRates did a similar survey across a broader range of economic groups and found total planned holiday spending of 65+ is $2,388, with the older generation spending more than the younger generations. Do the numbers add up? If half of the GoBankingRates stated 65+ spending goes to grandchildren, $1194, and OppLoans' per grandchild spending is correct, $218, that means the average grandparent has 5.5 grandchildren. Lo and bold, the average number of grandchildren grandparents have is 5 to 6, right in the middle. Oklahoma grandparent spent the most at $339 per grandchild. Nebraska grandparent spent the least at $93 per grandchild. Grandfathers spend more than grandmothers, $244 vs $202. How Much Should I Spend on My Grandchildren? This is a very personal question and should be determined by how much you can afford, the parent's wishes, and the purpose of the giving. I personally like my parents to give fewer gifts to my daughter. Beyond the unnecessary spending of money, I prefer more meaningful gifts, like a new chapter book I can read with her, rather than a pile of LOL dolls that will be forgotten within a week. How much do you plan on spending on your grandchild or expect your parents to spend on your children?